cyclists win a VIP Skoda trip to an alpine stage at this year's Tour de France. 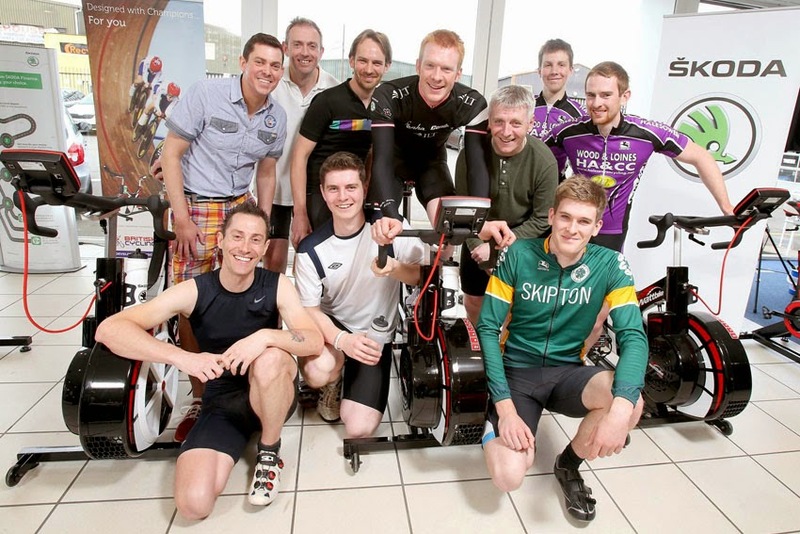 The fastest three from the heats, Peter Edwards of Hall Green, Thomas Gregory of Halesowen, and Adam Holmes of Stourbridge, then went on to experience a once in a lifetime opportunity to take on Ed Clancy himself, in a battle of the Wattbikes. Thomas Gregory and Adam Holmes were announced the top two cyclists from the day, with Holmes triumphing to become the overall winner, completing his 750-m sprint in an impressive 41.46 seconds, beating Ed Clancy's time on the day of 42.28 seconds. The winning cyclists were each rewarded with a VIP prize, which will see them passenger in an official Skoda Tour de France vehicle for a stage, ride with a previous Tour de France winner and enjoy a birds-eye view of the action from a helicopter ride over the race. Riders who took part were also entered into a competition to win a brand new Skoda Rapid Spaceback 1.2 SE, the brand's first compact family hatchback, worth more than £16,000. Launched in January, the Rapid Spaceback is an ideal choice for cyclists and sports enthusiasts. Combining style with practicality, the vehicle offers a generous 415-litre load capacity, allowing for clever storage and enough room for an internal bike rack to safely secure equipment. Money donated from the event was donated to Cancer Research UK, the world's leading charity dedicated to beating cancer through research. "It was a great event. Everyone who took part put in 100 per cent and congratulations to Adam on his win. He definitely has potential for track events and from today's performance, I wouldn't mind following him in a team sprint!" said Ed Clancy, double Olympic gold medalist. Robert Blackham, Brand Manager, Trust Skoda Wolverhampton, added, "This was an action-packed event and we're delighted by the great turn out from local cyclists and their supporters. Not only has the event encouraged the community to get riding, but all the money raised will be going towards a great cause." "Skoda has a strong cycling heritage and is a long-standing champion of cycling worldwide. We're pleased to see so many enthusiasts getting on their bikes and getting involved. The event was a great success and also raised money for Cancer Research UK. As such an inspirational figure in cycling, we'd also like to extend our thanks to Ed Clancy for his involvement." Skoda provides vehicles to the Tour de France, Tour of Britian and Prudential RideLondon as well as other major cycling events across the world. In the UK, the manufacturer is also the official vehicle partner for a number of professional cycling teams, including Matrix Vulpine, Team Raleigh and Rapha Condor JLT.